N-acetylcysteine is a remarkably active agent shown to be useful in a variety of clinical settings. The drug has actions relevant to radiocontrast-induced nephropathy (RCIN) that include vasodilatation, enhancement of renal medullary blood flow, and antioxidant properties. The drug’s pharmacokinetics are remarkable for almost complete first pass metabolism after oral administration, resulting in no free drug reaching the circulation. After intravenous administration, extensive reaction with tissue and plasma proteins greatly limits the amount of circulating free drug. Given the difficulty achieving free drug in the systemic circulation, it is highly likely that the drug works via its metabolites. The primary mechanism may be through L-cysteine as a cellular source for glutathione production. Clinical studies of N-acetylcysteine in the prevention of RCIN have yielded highly mixed results; five were dramatically positive, and eight others had no demonstrable efficacy at all. The following will review the individual studies, attempt to reconcile the divergent results, and propose future research needs. Radiocontrast-induced nephropathy (RCIN) may be defined as an acute deterioration of renal function occurring after exposure to radiocontrast media (RCM). Its incidence varies depending on how it is defined in terms of increase in serum creatinine, on prophylactic measures employed, and on the basal risk profile of the population studied. The greatest impact of RCIN is in severe cases that may require treatment with renal replacement therapy. In recent studies of patients considered to be at increased risk, the frequency of need for dialysis ranged from 0% to 2.6% (1–4⇓⇓⇓). Less severe renal dysfunction occurs in 11% to 45% of high-risk patients (1–3,5–8⇓⇓⇓⇓⇓⇓). The clinical impact of lesser degrees of renal impairment may include increased morbidity, extended length of hospital stay, total cost of care, and an association with increased mortality risk (9–12,13⇓⇓⇓⇓). Because there is no medical treatment for established RCIN, much interest has been directed at approaches to renal protection and prophylaxis. Saline hydration has been the most widely used approach, and is believed to be at least partially effective (14). In recent years, N-acetylcysteine (NAC), an inexpensive agent with multiple biologic actions, has been extensively studied, with some reports indicating outstanding efficacy in the prevention of RCIN. The drug was initially introduced into clinical medicine as a mucolytic agent, which led to its use in pulmonary diseases complicated by obstructive mucous production. Later its antioxidant properties led to use in treatment of acetaminophen overdose (15–17⇓⇓) and in ischemic cardiac diseases (18,19⇓). The purpose of this review is to review the pathogenesis of RCIN, to explore the biologic effects and pharmacokinetics of NAC, and to critically review the literature on the efficacy of this agent. To appreciate the potential benefit of NAC, it would be helpful to first review the pathogenesis of RCIN. A single and precise pathophysiologic mechanism for the development of RCIN, which can predict and account for the plethora of generally accepted risk factors, has yet to be defined. It is of interest to note that only 20 yr ago, renal ischemia, currently the most comprehensive postulate, was felt to be the least likely mechanism (20). Many of the hypotheses for the pathogenesis of RCIN and the search for reliable animal models were founded on clinical observations of risk factors for RCIN, which include: volume depletion, salt depletion, renal insufficiency, heart failure, age, gender, diabetes, atherosclerosis, intra-arterial injection of contrast, and previous history of contrast nephropathy (20–22⇓⇓). The processes invoked are (1) renal ischemic injury (secondary to changes in arterial blood flow and altered distribution of intrarenal blood flow, endothelial cell function, tubuloglomerular feedback, and red blood cell deformities); (2) tubular epithelial cell toxicity (secondary to disruption of cell integrity, oxygen radical generation, and apoptosis); (3) intratubular obstruction; (4) hemoglobin oxygen saturation curve shifts; and (5) immunologic reactions. Although not excluded, the last three processes have not been the subject of extensive studies and will not be discussed further. RCIN has long been known to be associated with changes in renal blood flow. There is a biphasic vascular response with a brief period of vasodilation, followed by prolonged vasoconstriction (23–27⇓⇓⇓⇓). Within the kidney, there appears to be a further redistribution, or shunting, of blood flow resulting in reduced flow to the medulla (28). Evidence for the effects of the decreased flow on kidney function and structure was provided by the work of Heyman et al. (29). These investigators induced RCIN in rats by performing uninephrectomy and treatment with indomethacin before radiocontrast media infusion. They found decreased renal perfusion as well as a decrease in sodium reabsorption. There was severe morphologic injury limited to the outer medulla, an area highly prone to ischemic injury, in thick ascending limb segments. The structural changes correlated closely with reduced creatinine clearance. It was concluded that hypoxic injury resulted from an imbalance in metabolic supply and demand, ischemia due to vasoconstriction in the face of increased metabolic work related to increased sodium delivery (29–32⇓⇓⇓). The oxygen content of the medulla has, in fact, been demonstrated to decrease after RCM infusion (33). Prasad et al. (34) used a noninvasive technique to confirm that radiocontrast injection is followed by a decrease in medullary oxygen concentration. The precise mechanism of the decrease in blood flow in RCIN is unclear at present, but it has been variously ascribed to an effect on tubularglomerular feedback (TGF), a direct effect on endothelial cells, an imbalance between vasodilatory and vasoconstrictive hormones, and an effect on the vascular smooth muscle itself. The osmotic load following filtration of contrast media has been proposed to act on the juxtaglomerular apparatus resulting in vasoconstriction (TGF) (35,36⇓). The involvement of various mediators of vascular tone and TGF has been the subject of several investigations as well as clinical trials using antagonists of endothelin (37–40⇓⇓⇓), adenosine (23,41,42⇓⇓), and nitric oxide (43,44⇓). The concept that direct tubular epithelial cell toxicity may have a role in RCIN arose from studies showing that contrast media caused an enzymuria (45,46⇓). Hizoh et al. (47) found that high osmolar contrast media caused detachment in cultured cells and suggested that tubular tonicity may represent another pathogenic process of RCIN. Humes et al. (45) found that proximal tubular isolates had reduced ATP and increased intracellular calcium content (a marker of injury) after radiocontrast exposure. Furthermore, it has been found in cultured cells that epithelial membrane permeability is decreased and tight-junction proteins are redistributed when exposed to hyperosmolar conditions or contrast agents (46). This may be consistent with the observation of reduced RCIN risk with low osmolarity agents (26). These findings, although not sufficient to fully explain the clinical characteristics of RCIN, do underscore that tubular toxicity (presumably due to tonicity) may be a component of the pathogenesis of RCIN and provide one reason for the clinical success of avoiding dehydration and the preferential use of low osmolarity contrast agents (36). There is evidence that the action of oxygen-free radicals and lipid peroxidation are involved in contrast nephropathy (48–50⇓⇓). Osmotic stress can initiate the production of reactive oxygen species (ROS) (51), and radiocontrast has similarly been shown to cause their generation (45) presumably through osmotic affects (52). Bakris et al. (48) studied radiocontrast media infusion in dogs, and found an increase in ROS generation. Furthermore, administration of drugs that either blocked the production or increased degradation of ROS attenuated the reduction in GFR. In contrast to the body of work associating RCIN with oxidative injury, Zager et al. (53) recently found that tubular damage in RCIN can be completely dissociated from cellular oxidative stress. Radiocontrast results in apoptosis of tubular epithelial cells in vivo (54) and in cultured cells (47,55⇓). Hizoh et al. (47) found that contrast-induced apoptosis in cultured cells was due to hyperosmolarity and not hypoxia. In contrast, other studies have found that epithelial cell apoptosis occurs after contrast-induced decreases in medullary oxygenation (54). Testing the hypothesis that antioxidant maneuvers might decrease hyperosmolar-induced apoptotic changes, Hizoh and Haller (52) found that taurine but not NAC blocked the effect, indicating that the induction of apoptosis may not be due solely to oxidative stress. N-acetylcysteine is a modified form of the amino acid cysteine, in which the nitrogen atom of the amino group is attached to an acetyl group. The chemical formula is C5H9NO3S, and the molecular weight 163.2 g/mol (Figure 1). The drug has been administered by oral and intravenous routes and via respiratory nebulizer. We shall focus on exploring the pharmacology of the oral and intravenous routes of administration. Figure 1. Chemical structure for N-acetylcysteine. The acetyl group provides stability, but the NAC’s potent reactivity is due to the sulfhydryl group. Early studies of NAC pharmacology were hindered by difficulty in analysis. Much of this problem relates to the great activity of the drug’s thiol (S-H) group, which reacts in vivo to form disulfide linkages, oxidizing the drug (56). The drug may, therefore, be found in free form in serum or bound in disulfide linkages with a wide variety of proteins (57). The analytic system must, therefore, be able to measure both reduced and oxidized NAC present in soluble and proteinaceous fractions of the sample. Using such methods, it has been found that the plasma half-life of NAC after intravenous injection is approximately 6 to 40 min. The majority of recent studies of NAC in the prevention of RCIN have involved oral dosing. Of note, it was found that free drug was undetectable, and oxidized NAC was present only in low concentrations, after oral administration of 200 mg of NAC, Cotgreave, and Moldeus (56). The less than 5% bioavailability was believed to be due to extensive first pass metabolism. Furthermore, Harada et al. (58) recently demonstrated that intravenously administered NAC binds extensively to plasma and tissue proteins, forming disulfides. As a result, little free NAC circulates even after intravenous injection. Others have confirmed the poor oral availability of NAC. Borgstrom et al. (59) studied normal volunteers and found the bioavailability to be between 6 and 10%, with less bioavailability for slow release formulations. Olsson et al. (60) also studied normal volunteers and found the oral bioavailability to be 4%. Burgunder et al. (61) found that only a small fraction of administered NAC reached circulation in its free form. Bridgeman et al. (62) found no free NAC in plasma after oral administration. More recently, Tsikas et al. (63) used HPLC to demonstrate that no NAC is detectable in plasma after oral administration. Taken together, these results indicate that free NAC is almost completely metabolized before entering the systemic circulation. The low bioavailability of NAC after oral dosing is probably due to extensive first pass metabolism. Indeed, it has been repeatedly demonstrated that the intestines and liver effectively deacetylate NAC (64–69⇓⇓⇓⇓⇓). The reaction, in humans, is primarily catalyzed by the enzyme acylase I (67). After rapid intestinal deactylation in rats, the major metabolites entering the circulation include cysteine, cystine, inorganic sulfites, homodisulfides of NAC, and labile disulfide complexes with plasma and tissue proteins (61,68⇓). The deacetylation is so efficient that, in the portal vein circulation, the concentrations of metabolites is 300 to 500% higher than that of the parent drug (68). The resulting cysteine may be used in the liver to generate glutathione, the major endogenous antioxidant produced by cells (61–62,68,70⇓⇓⇓), although not all investigators have found this to occur (71). Hepatically derived glutathione may subsequently enter the systemic circulation (62). In addition to the generation and increased serum levels of glutathione after oral NAC dosing, plasma homocysteine levels decrease significantly (72). In the following sections, NAC’s biologic actions will be reviewed. The preceding discussion should make clear that NAC’s in vitro activities must be separated from its in vivo actions. Indeed, there is such extensive first pass metabolism of NAC after oral dosing that almost no free drug becomes available to the systemic circulation. Any therapeutic benefits of oral NAC are probably not direct effects, but rather secondary effects such as by the induction of glutathione synthesis. This may well be true of intravenously administered NAC as well, because of the extensive disulfide formation with plasma and tissue proteins, as described above. 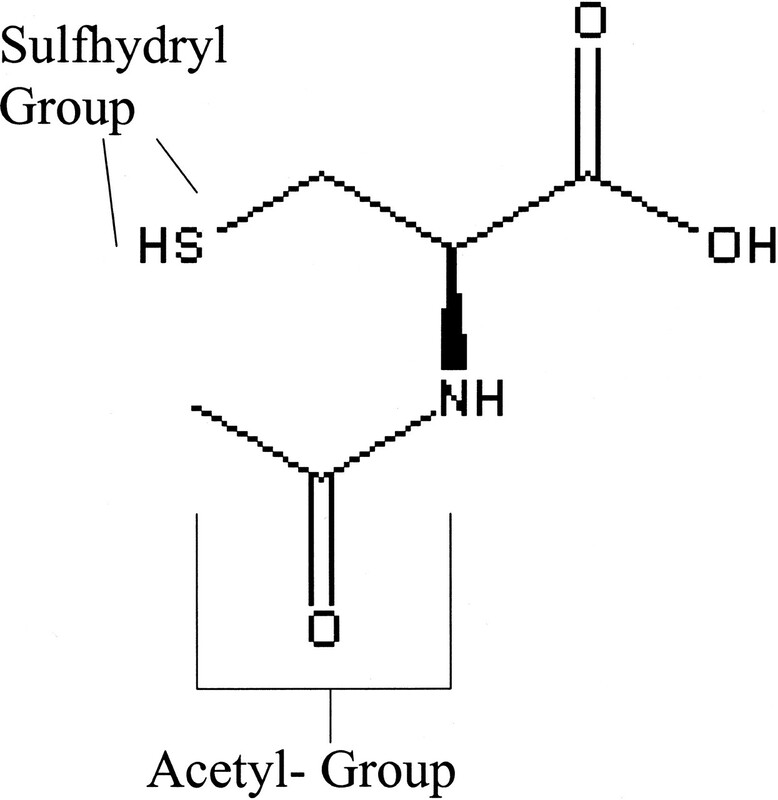 N-acetylcysteine’s first therapeutic use was as a mucolytic agent. The drug probably works for this purpose by breaking disulfide linkages between the glycopeptides in mucous (73). Administration for this use is generally by respiratory nebulizer because, with oral administration, no active NAC reaches alveolar fluids (74). A major clinical role for NAC is in the treatment of acetaminophen overdose. Acetaminophen is metabolized by the liver, resulting in the production of N-acetyl benzoquinoneimine (75,76⇓), which leads to depletion of hepatic glutathione. Administration of NAC replenishes glutathione stores and reduces hepatic injury (77,78⇓). Treatment is particularly effective if initiated within 10 h of overdosage (75). Interest in NAC for prevention of RCIN was greatly stimulated by the publication by Tepel et al. (4) in 2000 of study results indicating outstanding efficacy. In this section, we explore NAC’s potential therapeutic role in RCIN by examining its relevant biologic actions. It must be noted that, although NAC has had a multitude of biologic effects reported, we will focus on those effects most likely to be relevant to RCIN’s pathogenesis. Recently, there has been a great increase in interest regarding NAC’s antioxidant properties. Oxidative stress occurs as a result of an imbalance between ROS and the body’s native antioxidant systems (79). NAC is one of a large group of exogenous antioxidant drugs that may protect against oxidative tissue injury (80). The antioxidant effects of NAC may be directly related to the drug itself or to the secondary induction of glutathione production. Among direct effects of NAC are reactions with hydroxyl radicals (·OH), resulting in their inactivation (15,81,82⇓⇓). In the process NAC is converted into NAC thiol radical intermediates, and finally into NAC disulfide (56). The reaction with ·OH is rapid and vigorous, with a rate constant of 1.36 × 1010 M−1 sec−1 (81). The drug is a less effective scavenger of superoxide anion (O2·−1) and hydrogen peroxide (H2O2) (81). Published studies of direct antioxidant effects of NAC have generally been performed in vitro. The significance is questionable given the pharmacokinetics of NAC discussed above. Little reduced NAC actually reaches the bloodstream after oral administration. A secondary antioxidant effect of NAC is indirect via the induction of glutathione synthesis. Glutathione (GSH) plays a key role in the cellular defense against oxidative damage (83,84⇓). It cannot enter hepatic cells, rather it must be synthesized in situ from its precursors, glycine, glutamate, and cysteine. Cysteine is the rate limiting component, and cysteine’s sulfhydryl group gives GSH its antioxidant power. Upon deacetylation, NAC becomes L-cysteine, entering cells where it may serve as a precursor for GSH synthesis. Indeed, NAC has been shown to prevent GSH depletion and/or to increase hepatic GSH levels (77,85–87⇓⇓⇓). In the kidney, glutathione has been shown to be reduced in the ischemia/reperfusion model of acute renal failure (88,89⇓). Administration of NAC has been demonstrated to increase renal intracellular GSH levels in rats (90). It is not known whether oral or intravenous NAC administration in humans would increase renal GSH concentrations. There are other biologic actions of NAC that may be salutary in preventing RCIN. Because vasoconstriction is believed to be a contributing pathogenic factor in RCIN, vasodilatory effects may prove helpful. This applies to NAC, perhaps via its ability to stabilize nitric oxide (91,92⇓). The sulfhydryl group donated by NAC converts nitric oxide to S-nitrosothiol, a compound with greater stability and greater ability to activate of guanylate cyclase (93). Indirect evidence for the role of this mechanism comes from the findings that (1) NAC improved renal vasodilation in response to acetylcholine (94) and (2) NAC improved renal function in the intensely vasoconstrictive hepatorenal syndrome (95). Moreover, Heyman et al. (96) administered radiocontrast media to rats to induce vasoconstriction. After intravenous administration of NAC, there was a reduction in vasoconstriction, which was also found after vasoconstriction induced by the nitric oxide inhibitor nitro-L-arginine (L-NAME). The authors concluded that NAC has an important vasodilatory effect in the preconstricted renal vasculature. They believe, however, that the effect was not mediated by nitric oxide. There is also evidence for renal medullary vasoconstriction in RCIN (34). Conesa et al. (94) studied NAC in acute renal failure induced by inferior vena cava occlusion, a model that causes reduced medullar blood flow. They found that NAC improved the renal failure and outer medullary vasoconstriction and blood flow. In this study, the effect was dependent on the presence of nitric oxide. Another mechanism by which NAC may shift the vasoregulatory balance toward vasodilation is by inhibiting angiotensin-converting enzyme. The effect may be mediated by the drug’s sulfhydryl group (97). Taken together, these studies provide preliminary evidence for NAC as a vasodilatory agent (perhaps mediated via nitric oxide) that may protect against vasoconstriction in certain forms of renal disease. To the extent that vasocontriction is important in the pathogenesis of RCIN, this may prove to be an important renoprotective mechanism of NAC. Interest in this area grew rapidly with the publication of the seminal study by Tepel et al., which demonstrated outstanding efficacy for NAC. Since then, a number of studies with similar methodology have been published in rapid sequence with decidedly mixed results. The dose used in these studies was quite low compared with that administered as treatment for acetaminophen overdose. In most RCIN studies, NAC was given as 600 mg orally twice daily for 2 d. In acetaminophen overdose, an NAC loading dose of 140 mg/kg (9800 mg in a 70-kg patient) is followed by repeated doses of 70 mg/kg. It has been believed that this high dose can overcome the extensive first pass metabolism that deactivates NAC (as discussed above). The definition of RCIN was generally an increase in serum creatinine (SCr) of 0.5 mg/dl or 25% above baseline at 48 h after contrast dosing. By itself, such an increase may not greatly impact clinical outcomes. However, it may be a reasonable surrogate for more relevant outcomes such as need for dialysis. Such an assumption is reasonable to the extent that a chain of evidence connects the surrogate to the more global outcome measure of interest (98). This is likely true in RCIN because the magnitude of renal dysfunction is probably a function of disease severity (there is probably a continuous gradient between mild and severe renal failure) rather than pathologic heterogeneity (a different disease process causing mild than that causing severe disease). In this study, 83 patients undergoing contrast-enhanced CT scanning, with serum creatinine above 1.2 mg/dl or creatinine clearance <50 ml/min, were enrolled. All patients received iopromide media in a volume of 75 ml, and intravenous hydration with 0.45% saline at a volume of 1 ml/kg body weight, for 12 h before and after the procedure. Patients were randomized in double blind fashion to treatment with NAC 600 mg orally twice daily on the day before and the day of the CT scan. Acute renal failure was defined as an increase in serum creatinine (Scr) of 0.5 mg/dl. Ten of eighty-three patients studied developed acute renal failure. The rate was dramatically higher in the placebo-treated group, 21% compared with 2% in the NAC group. In the NAC-treated group, the mean Scr actually decreased from 2.5 mg/dl to 2.1 mg/dl. No patient in the study required dialytic support. However, Scr remained elevated in most patients with ARF by day 6. The drug was relatively well tolerated with only 10% of patients reporting gastrointestinal side effects (4). This study from our group tried to replicate Tepel’s finding in patients undergoing cardiac angiography. Patients with Scr ≥ 1.7 mg/dl were randomized by double blind methodology to treatment with either placebo or NAC 1200 mg orally 1 h before angiography and a second dose 3 h after the procedure. All patients received intravenous hydration with the regimen determined by their cardiologist and nephrologist. As in Tepel’s study, acute renal failure was defined as an increase in Scr of 0.5 mg/dl. We found no significant difference in the rate of renal failure in the two study groups (placebo, 9 of 41 [22.0%]; NAC, 10 of 38 [26.3%]; P = NS). There was one case requiring dialysis in each group (2). Among patients with diabetes mellitus, there was a 51% increased rate of acute renal failure in NAC-treated patients, with a P value of 0.09 (less than the specified level for significance of 0.05). This trend toward potential harm of NAC in patients with diabetes mellitus may be consistent with earlier findings by Weisberg et al. (99). These investigators found that vasodilator drugs increased the risk of RCIN in diabetic subjects. Indeed, as discussed in the biologic actions of NAC section above, NAC does seem to have relevant vasodilatory properties that may be harmful to patients with diabetes. Diaz-Sandoval et al. (8) studied 54 patients undergoing cardiac catheterization with Scr > 1.4 mg/dl or CrCl < 50 ml/min. All patients received intravenous hydration with 0.45% saline for variable infused volumes. Patients were randomized to treatment with placebo or NAC by Tepel’s regimen. Contrast nephropathy, defined as an increase in Scr of 0.5 mg/dl or 25% over baseline, occurred in 45% of control patients compared with 8% in the NAC group (P = 0.005). It is unclear why the rate of RCIN was so high in the placebo group, because the patient’s characteristics and risk profile were not very different than the previous studies. Kay et al. (1) studied 200 patients in Hong Kong with creatinine clearance <60 ml/min, all undergoing cardiac angiography. Patients received 0.9% saline hydration and were randomized in double blind fashion to treatment with placebo or NAC by the Tepel protocol. A 25% increase in Scr occurred in 4% of NAC patients compared with 12% of controls (P = 0.03). In contrast to Durham et al. (2), Kay et al. (1) found benefit was greater in patients with diabetes mellitus. Shyu et al. (6) studied 200 patients undergoing cardiac angiography with Scr > 2, or CrCl < 40 ml/min. All patients received intravenous hydration with 0.45% saline. Patients were randomized in single-blind fashion to treatment with NAC at 400 mg orally twice daily for 2 d or placebo. Serum creatinine increased by 0.5 mg/dl in 3.3% of the NAC group subjects compared with 24.6% in the control group (P < 0.001). Baker et al. (100) randomized 80 patients undergoing cardiac angiography to treatment with intravenous NAC with intravenous hydration to treatment with intravenous hydration alone. The dose of NAC was 150 mg/kg in 500 ml N/saline over 30 min immediately before contrast followed by 50 mg/kg in 500 ml N/saline over 4 h. Radiocontrast nephropathy was significantly reduced in the NAC group, 5% versus 21% in controls. The NAC infusion had to be terminated early in three patients due to side effects. This study was notable for the intravenous route of administration and the very high NAC doses used. The rapid infusion time would be very practical for patients in which the need for early drug administration would postpone the cardiac procedure excessively. Allaqaband et al. (3) enrolled 123 patients scheduled for cardiac angiography who had Scr > 1.6 mg/dl or CrCl < 60 ml/min. There were three treatment groups in this unblinded study: one treated only with saline, one with fenoldapam, and one with NAC by the Tepel protocol. All patients received intravenous hydration, and RCIN was defined as an increase in Scr > 0.5 mg/dl at 48 h postprocedure. There was no significant difference in the incidence of RCIN between the groups: 17.7% in the NAC group, 15.3% in the saline group, and 15.7% in the fenoldopam group (P = 0.919). Boccalandro et al. (5) studied 73 consecutive patients undergoing cardiac catheterization who had Scr > 1.2 mg/dl, and CrCl < 50 ml/min. Patients were randomized to treatment with intravenous hydration alone or with NAC using the Tepel protocol. There was no placebo group. All patients received intravenous hydration, and RCIN was again defined as an increase in Scr of 0.5 mg/dl. The incidence of RCIN was 13% in the acetylcysteine versus 12% in the control group (P = 0.84). By multivariate analysis no unforeseen effects of NAC were noted. Briguori et al. (7) studied a broader population, patients undergoing either cardiac or peripheral angiography. Patients had Scr > 1.2 mg/dl or CrCl <70 ml/min, and all patients were treated with intravenous hydration. Patients were randomized to treatment with intravenous hydration alone or with NAC using the Tepel protocol. There was no placebo group. An increase of >25% in Scr 48 h after the procedure occurred in 6 (6.5%) of 92 patients in the NAC group and in 10 (11%) of 91 patients in the hydration alone group (P = 0.22). Goldenberg et al. (101) performed a randomized trial of 80 patients with Scr > 1.5 mg/dl having cardiac catheterization. Patients were treated with intravenous hydration with 0.45% saline and placebo or NAC at a dose of 600 mg orally thrice daily for 2 d. An increase in Scr of 0.5 mg/dl at 48 h was seen in 4 of 41 patients in the NAC group compared with 3 of 39 in the control group (P = NS). Loutriakis et al. (102) studied 47 patients with Scr > 1.5 mg/dl undergoing cardiac catheterization. Patients were randomized to treatment with NAC by the Tepel protocol or placebo. All patients received supplemental intravenous hydration. An increase in Scr of 0.5 mg/dl or 25% from baseline occurred in 25% of NAC-treated patients and 13.1% of placebo-treated patients (P = NS). Oldemeyer et al. (103) randomized 96 patients having coronary angiography, all with creatinine clearance <50 ml/min to treatment with NAC 1500 mg orally every 12 h for four doses or placebo. The definition of RCIN was an increase in Scr of 0.5 mg/dl or 25% compared with the baseline value. All patients were hydrated with 0.45% saline at a rate of 1 ml/kg BW for 12 h before and after the procedure. The rate of RCIN was 8.2% in the NAC group and 6.4% in the placebo group (P = 0.74). No protective effect of NAC was found, even among patients with more severe renal disease at baseline. Vallero et al. (104) studied 100 consecutive coronary angiography patients, of whom 20 had Scr >1.2 mg/dl. All patients received intravenous hydration. Randomization was between placebo and NAC administered per the Tepel protocol. Two patients in the NAC group and none in the placebo group had increases in Scr of 0.5 mg/dl at 48 h (P = NS). The studies described above have all occurred over a 3-yr period, emphasizing the great interest in the prevention of RCIN with NAC. Because of the safety and low cost of this drug, as well as the lack of any other agent proven to prevent RCIN, NAC use has become widespread during this period. The results of the published studies, however, are remarkably divergent. Five studies demonstrate dramatic efficacy, and eight show absolutely no effect. In this section, we will review the published studies with a focus on trying to reconcile the conflicting results. The studies are remarkably similar, for the most part, in size and methodology. In addition, they all benefit from relatively open entry criteria, which make it simple to extrapolate results to the typical patient population. Table 1 lists the studies, categorized by positive or negative results, highlighting certain design differences. Recently Birck et al. (105) systematically reviewed the literature in the form of a meta-analysis. They found an overall positive treatment effect with a reduction in RCIN risk of 56% with the use of NAC. However, this early analysis was conducted using only the first 7 reported NAC trials. As the authors note, the value of meta-analysis in this field may be limited due to study heterogeneity and the strong bias against submission and publication of negative studies. One important difference between the studies might have been in the degree of risk for RCIN in the populations studied. Since most of the studies defined RCIN nearly identically, the incidence of RCIN in the control groups sheds light on the risk profile of the patients studied. It is immediately clear that the rate was significantly lower in the negative studies; the control group mean of 24.8% in positive studies compared with 11.0% in the negative studies (simple mean, statistical significance not tested). This finding is surprising because the entry criteria for all of the studies were similar. Nonetheless, the difference would suggest that the negative studies enrolled patients at lower overall risk of RCIN. By extension, the greatest potential benefit of NAC may be in higher risk patients. One initial hypothesis of our group was that our negative results might have reflected the decision to administer NAC only on the day of the procedure (1200 mg 1 h before and 3 h after the procedure) (2). This is in contrast to the protocol used in most studies (NAC 600 mg twice daily on the day before and on the day of the procedure). Might it be that the early doses were necessary for efficacy? It should be noted that several of the negative studies involved NAC administration on the day before the procedure, and the study of Baker was positive despite administration only on the day of the procedure (intravenous dosing). NAC’s short half-life and extensive first pass metabolism (1 to 6 h) would suggest that any drug administered the day before the procedure would not be of benefit. However, because NAC’s salutary effects may be mediated indirectly (glutathione induction), the native drug’s half-life may be less important. There is little published evidence to help understand the time course of orally administered NAC’s effect on intrarenal glutathione levels. Therefore, early dosing may be necessary when the drug is administered orally. Another intriguing difference between the studies is in their geographic location. Five of six American studies were negative. This may just be a chance observation, but we should consider the possible implications. The formulation of NAC available in the United States is usually a liquid for oral administration. In Germany, the drug is distributed in a solid form, as a tablet. In Taiwan, the drug is distributed as solid granules. Because of NAC’s highly reactive sulfhydryl group, the inert substances that the drug is compounded with may impact the drug’s effectiveness. In addition, in US studies the drug was generally added to ginger ale, orange juice, or other beverages to help mask the flavor. It is conceivable that these may have changed the chemical nature of the drug. Finally, it is possible, given the small size of the studies, that either type I or type II statistical errors might be present. Meta-analyses may be helpful for systematically combining the results. Ultimately, however, only a well powered randomized controlled trial would prove efficacy. Given the sharply divergent published study results, it is difficult to synthesize strongly evidence-based recommendations for the use of NAC in the prevention of RCIN. However, until definitive studies evaluating efficacy are published, the current widespread use of NAC is probably appropriate because (1) there is no other effective drug treatment and because NAC is (2) inexpensive, (3) safe, and (4) well tolerated. The greatest risk of widespread use of NAC might be in dissuading investigators from conducting additional research into NAC’s activity and studies of other agents that may be effective. Furthermore, if dose timing is critical, when NAC is used in conjunction with other prophylactic regimens, which are the subject of study, its administration may confound the results of these studies. Selecting appropriate patients for treatment should follow a careful clinical evaluation for known RCIN risk factors such as diabetes mellitus, renal insufficiency, older age, dehydration, congestive heart failure, need for greater contrast volumes, multiple myeloma, and hypoalbuminemia (2,10,11,106–108⇓⇓⇓⇓⇓). It would seem that the Tepel administration protocol (600 mg orally twice daily on the day before and on the day of the procedure) is a reasonable treatment approach. Intravenous hydration was used in most of the studies and is felt to be an important treatment component (14,109–111⇓⇓⇓). If time permits, and the patient can tolerate a volume load, then 0.45% or 0.9% saline may be administered at 1 ml/kg per h for 12 h before and after the procedure. It should be noted that most NAC studies included a full course of intravenous hydration. In actual clinical practice, shorter hydration periods are the norm. Whether diminution of hydration time impacts NAC effectiveness is not known. For patients who present as an emergency, in whom NAC and hydration must be administered rapidly, intravenous NAC dosing may be helpful. Baker’s intravenous protocol of 150 mg/kg in 500 ml 0.9% saline over 30 min immediately before contrast, followed by 50 mg/kg in 500 ml 0.9% saline over 4 h, was found to be quite effective (100). Further research will be necessary to confirm these positive results. Since the publication of the first NAC prevention of RCIN study, the drug has rapidly become widely used in practice. This fact should not dissuade investigators from continuing to conduct research on the drug. Indeed, given the highly mixed results in the current literature, a definitive study on efficacy is needed. Furthermore, research into the optimal administration strategy would quite helpful because the Tepel protocol, with administration on the day before contrast exposure, is often impractical. Investigation into NAC drug formulations may be warranted, with particular attention toward whether the American liquid formulation may be less effective or lose its effectiveness when mixed with beverages to mask its unpleasant odor and taste. In addition, the mechanisms of NAC’s putative effect remain incompletely understood. Research seeking to delineate antioxidant versus vasodilatory properties would be particularly helpful.